In Slate, I discuss this dispute. The international law is interesting but, I fear, irrelevant. International organizations use a bewildering variety of voting rules. Courts, commissions, councils, and the General Assembly use majority rule. The WTO, the International Seabed Authority, the IMF, the World Bank, and the Security Council use various types of supermajority rule, sometimes with weighted voting, sometimes with voters divided into chambers that vote separately, sometimes with vetoes. The voting rules in the EU defy any simple description. Al Sykes and I try to bring some order to this mess in our new paper. Simon Caney argues, in a welcome departure from the usual claims in this area of philosophy, that negotiating a climate treaty is not just a matter of distributing burdens fairly, but also requires a climate treaty that countries are actually willing to enter–“feasible,” to use the word that David Weisbach and I use in our book Climate Change Justice. But he rejects our argument that the only feasible treaty is one that makes every state better off by its own lights relative to the world in which no treaty exists, and that if advocates, ethicists, and (more to the point) government officials insist that a treaty be fair (in the sense of forcing historical wrongdoers to pay, redistributing to the poor, or dividing burdens equally), there will never be such a treaty. He says that if a government refuses to enter a fair but burdensome treaty because it knows that voters will punish it for complying, then that just means that voters have a duty not to punish the government, and instead to compel the government to act according to the philosopher’s sense of morality. But because voters don’t recognize such a duty, we are back where we started. His underlying assumption seems to be that voters will cause governments to act morally; ours is that voters will (at best) acquiesce in a treaty that avoids harms that are greater than the costs of compliance. So while, unlike many philosophers, he recognizes a feasibility constraint, he waters it down beyond recognition. The EU’s recent backpedaling on climate rules shows once again that feasibility, not ethics, should be a necessary condition for proposals for distributing the burdens of a climate treaty. Source: Cingranelli-Richards Human Rights Dataset (0 (bad) to 2 (good)). 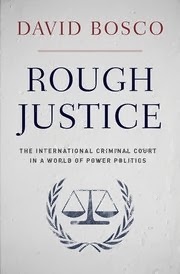 David Bosco‘s new book tells the history of the International Criminal Court. It is nicely done and will be a reference for everyone who does work in this area. The conclusion will not surprise any observers: the ICC survived efforts at marginalization by great powers but only by confining its investigations to weak countries. Thus, the ICC operates de facto according to the initial U.S. proposal, rejected by other countries, to make ICC jurisdiction conditional on Security Council (and hence U.S.) approval.